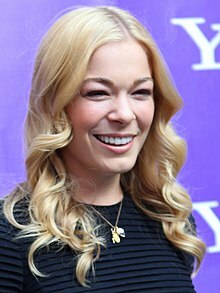 Margaret LeAnn Rimes Cibrian (born August 28, 1982), known professionally as LeAnn Rimes, is an American country and pop singer. Her first album Blue was released in 1996. She has won many major industry awards. ↑ "LeAnn Rimes". People.com. Retrieved January 7, 2014. Wikimedia Commons has media related to LeAnn Rimes. This page was last changed on 15 November 2018, at 15:53.